Not long ago I was talking to my Occupational Therapist and told her that I had just learned that my tumor appears to have not grown and seems to be dormant. I also told her that I felt that my reaction to the news was strange. Upon hearing this news I was thankful, but told myself “John you had better start working hard on your rehabilitation”. The truth is that I have already been working very hard on my rehabilitation. In fact I don’t know how I could work any harder, which is why my reaction surprised me. My wise therapist said “Now maybe you don’t have to worry about tumor anxiety”. I told her that I liked the phrase but had never heard it before. She remarked “I just made it up”. How about you? Do you ever wrestle with anxiety? If you are a human being my guess is that you do. Anxiety is something that I have wrestled with my whole life. I have dyslexia so whether it was grade school, high school, college or seminary, school it was an experience in anxiety for me. This anxiety carried over to the ministry. The first time that I ever preached on a Sunday morning I woke up at two a.m. sick to my stomach. This is something that I would experience many times. It took over ten years before I could sleep on a Saturday night on a weekend in which I was preaching. I am not proud of this, but I share it in the hope that it may help even one reader who is reading this post. Jesus tells us to “Have no anxiety about anything”. The first time I read this I was devastated. I thought not only am I anxious, but I am failing at faith as well. Even today I read this and I want to say “Come on Jesus, NO ANXIETY ABOUT ANYTHING – that’s impossible”. However, I don’t think that is what Jesus meant. I think what Jesus meant is, don’t let fear win. Let your faith be bigger than your fear, or as Susan Jeffers has said, “Feel the fear and do it anyway”. In First Peter 5:7 we get some pretty good advice. 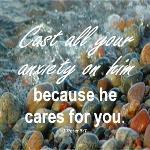 “Cast all your anxiety on him because he cares for you”. In my journey with anxiety there are two things that have really helped me. First, I visualize that Jesus is always with me as he has promised to be. Whether it is picturing him standing beside me in the pulpit or being next to me as I receive radiation, I am never alone. Second, since my tumor and my stroke I have felt precious little anxiety. This could be because my brain has been rewired, but I believe it is more than that. This journey has taught me that most of the things that we worry about are not worth worrying about and that it really is true, “God is a very present help in trouble”. I have had a very good week. While I have not recovered all of the strength that I lost during my latest bout during pneumonia, I have recovered some of it. The amazing folks at Courage Kenny pushed me hard as they always do. I went to a luncheon for one of my favorite organizations called TreeHouse, which changes the lives of troubled youth. We made some good progress on my website which should be launched in mid-November, and I got in a couple of nice bike rides. As always, the highlight of my week was snuggling with grandson Connor while we watched cartoons. Thank you for reading this, for your prayers and constant encouragement not only for myself but also for my family. Your prayers mean more than you could imagine. Together let us keep the faith, look upward, travel onward and do it anyhow even if we are afraid!